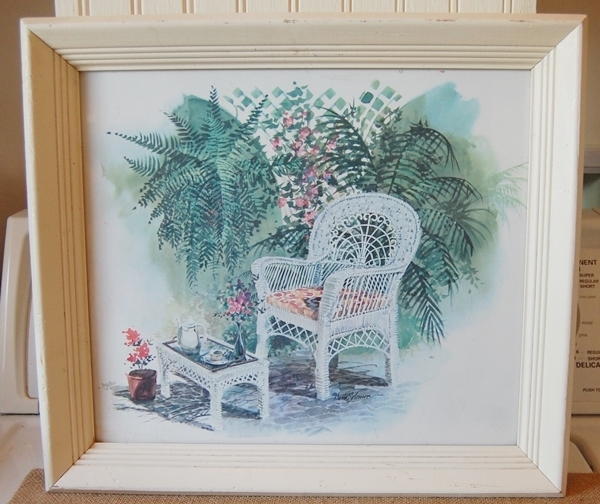 I wasn’t sure what I wanted to complete for this month’s challenge and as the month began to slip away and I did not have a chance to go back to the Habitat Restore, I decided to use this picture that I purchased for $2.00 there at the same time I purchased last month’s challenge item. I liked that it is a heavy wooden frame and it has some depth to it. Priced at just $2.00, it was just right for what I had in mind. I cleaned the frame using TSP and followed that up with some rubbing alcohol on the glass. 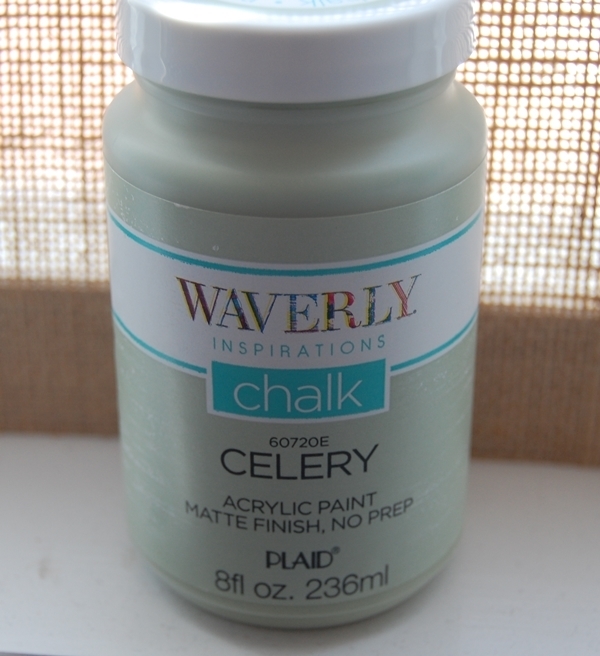 Once it was ready for painting, I chose to use an inexpensive brand of chalk paint. It’s Waverly Inspirations. My color choice was celery. I was pleasantly surprised when I first used this brand of paint. I’m in the middle of giving a new look to several small pieces of furniture and I used this and it works well. Since I already had it on hand, the cost for paint wouldn’t be pushing the $15.00 limit. I would not recommend using this paint on a large piece of furniture because it does take more paint to get full coverage. 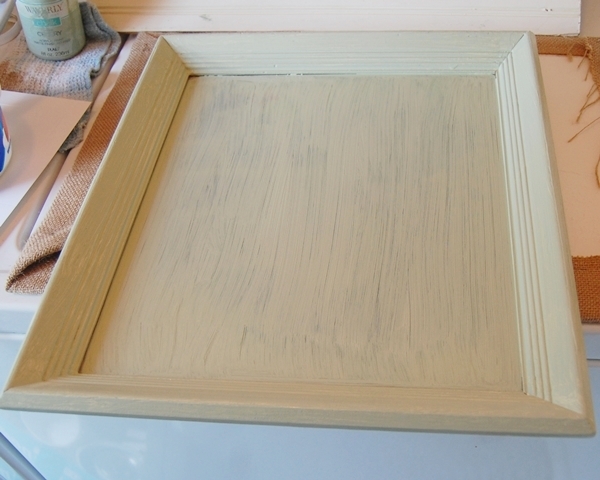 As seen here after one coat, the frame needs a second coat. The good news is that the paint dries quickly and after 15 minutes, it was ready for the second coat. The second coat adhered well, but still had a few streaky areas. After a third coat, it was looking good. 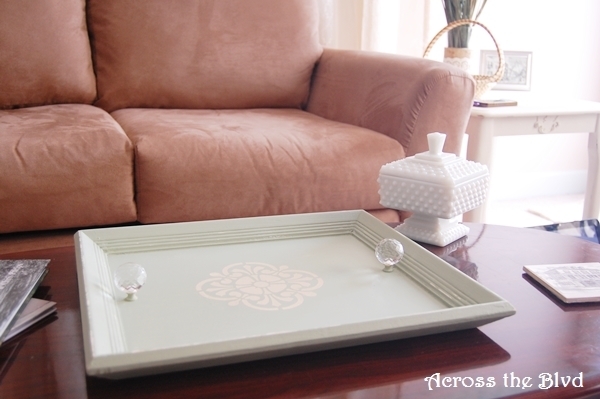 I love this stencil pattern and used it on a small side table a few months ago. It’s just the right size for this tray. Using painter’s tape, I secured it to the glass and painted it with more Waverly Inspirations. 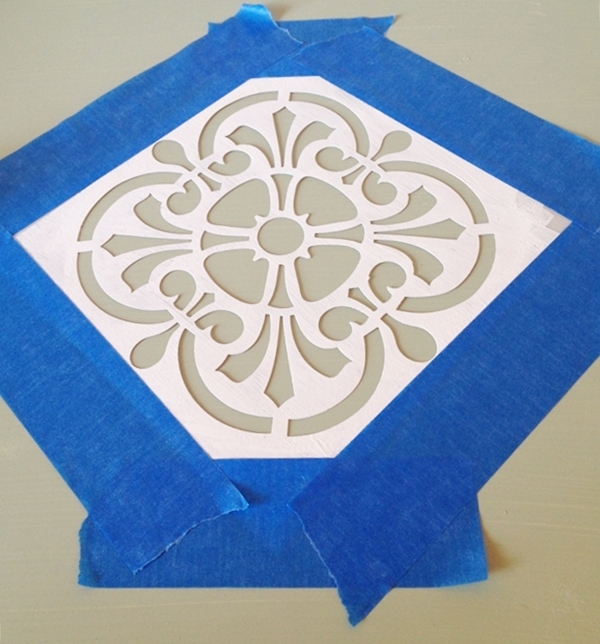 I let this dry for another 15 minutes, then pulled off the tape to reveal the pretty stenciled pattern in the center of the tray. This color is called Cashew. 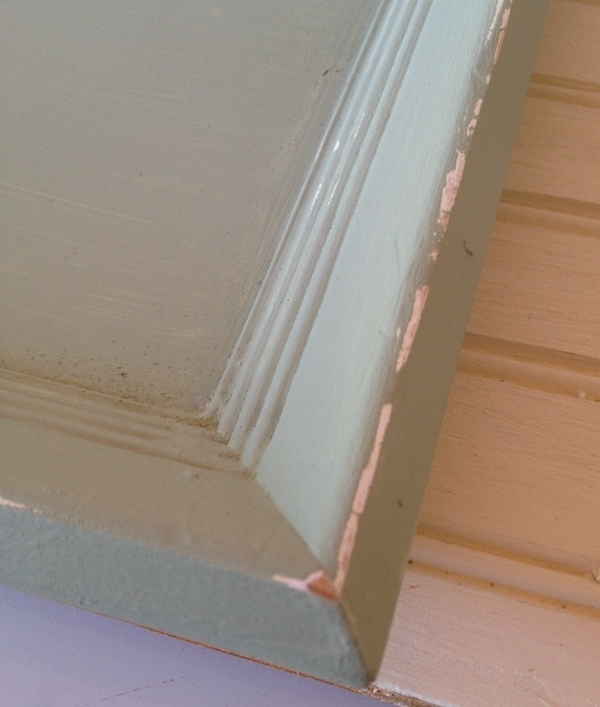 I sanded the rim and the corners of the frame to give it a distressed look. Once I was happy with how it looked, I wiped it down and then sprayed the tray with Minwax Polycrylic Spray Finish. 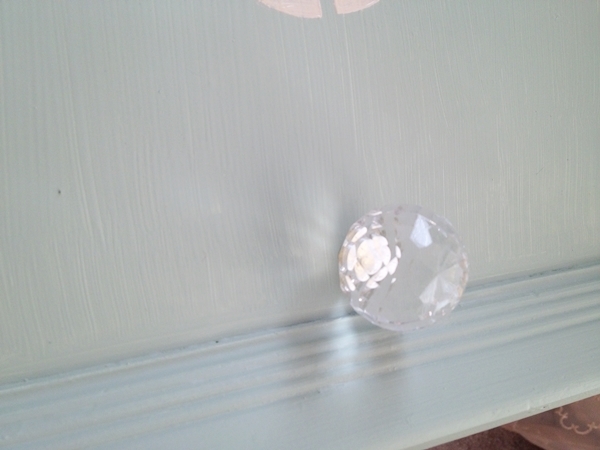 I’ve had two glass knobs stored away since I removed them from a bed headboard several years ago. I used Loctite Stik ‘n Seal Adhesive to secure them to the glass. 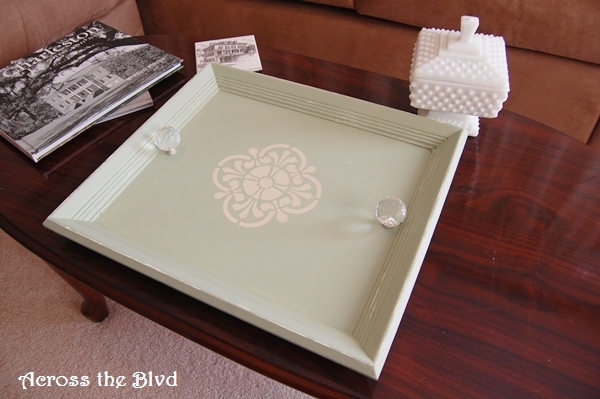 The total cost for this tray was $2.00 since I already had the paint, the stencil, the spray finish and the knobs on hand. I’m happy with the finished piece and it looks great along with the other painted pieces I’ve done for my room makeover. It’s sitting on a coffee table that is waiting to be my next paint project. You can follow along with June, 2015 Centsational Salvage Challenge by searching #ItsCentsational on Twitter and Hometalk. You can also find the The Centsational Salvage Challenge on Facebook. We party with some awesome bloggers! We’ll be sharing at lots of these great parties. Great project! 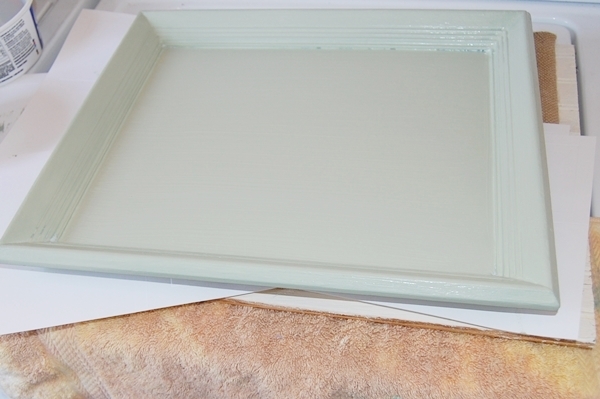 I love the celery color and that is the perfect frame to turn into a tray! 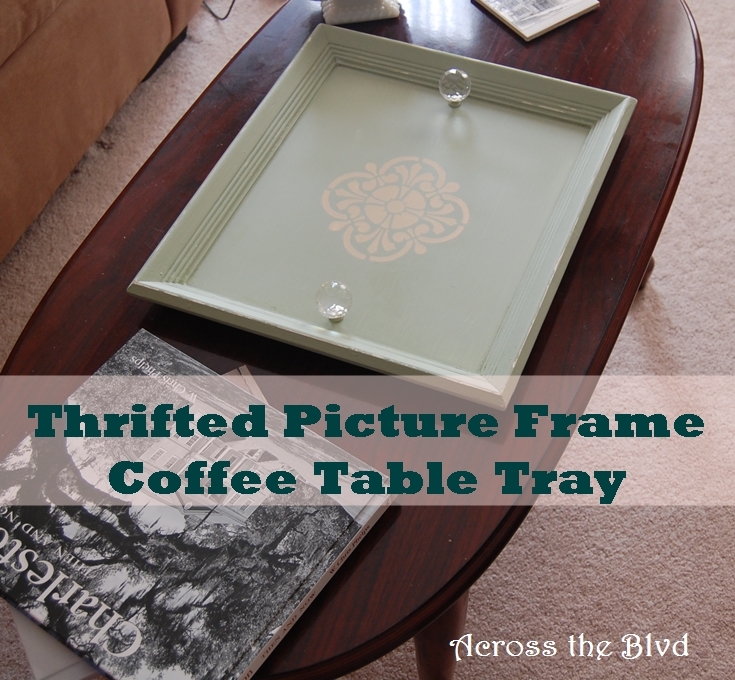 I love seeing these inexpensive items turned into something beautiful! I have recently used that same paint on my textures art project. Thanks, Laurie! I love that color, too. It’s so fresh and bright. It’s great to find things to use for something pretty! I like the price of that brand of paint and it does seem to work well for smaller projects. 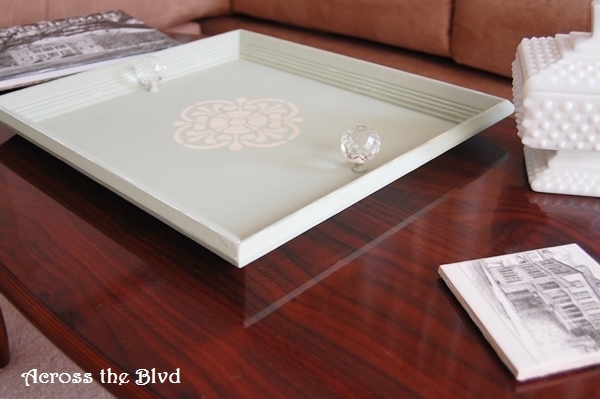 Thanks for linking up your gorgeous tray makeover at Brag About It! Thanks, Laurie! I’m always happy to share at Brag About It! What a brilliant idea! I love the color scheme and the design. It’s perfect:-) Thanks for sharing with us at Merry Monday. Thanks, Sherry. I’m really loving this shade of green lately. I’m always happy to share at Merry Monday. Thanks for stopping by. Thank you, Joy. I’m always happy to share at your party! Thanks for stopping by! What a lovely way to repurpose an old frame! 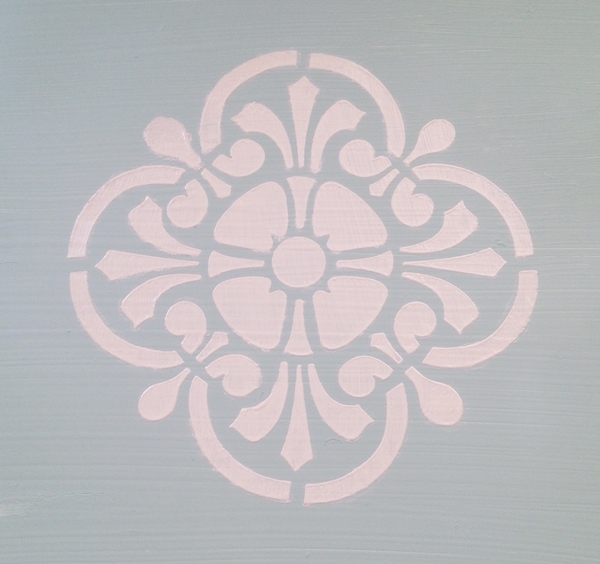 Love the color and applique stencil! Thanks, Gail! I love using stencils. They come in handy especially since I can’t draw at all! Very nice Beverly. I do like the glass knobs, they add an extra intrigue to the project. Thanks, Kathleen. I think the knobs give it a nice, finished look.